Wanderlust is the term used to describe the enduring and at times overpowering impulse to travel and explore the world. Once bitten by the deadly travel bug, travellers find it increasingly difficult to settle in to the mundane life of the nine-to-five rush and are often counting the seconds until they can get back on the road again. Liz Gilbert (played by Julia Roberts) was one such traveller and Eat Pray Love opens with her realisation that she no longer wants to be married and that she wants to travel for a year to find out who she really is. Liz finalises her divorce from her bewildered and heartbroken husband and leaving behind both her lover David (James Franco) and her career as a journalist, she embarks on a year-long trip to Italy, India and Indonesia. In Italy, Liz learns to eat. She learns to fall in love with food and she discovers the relationship between food, friendship, romance and happiness in Italy. Many women in English-speaking countries have an unhealthy relationship with food and it is linked to poor body image and that is precisely what she discovers in Italy. She also spends her time learning to speak Italian and making friends with other tourists and locals too. The purpose of Liz’s visit to India is to visit David’s ashram and it is in India that Liz learns to pray. She also learns that the culture there is very different to her own but that it is not up to her to interfere in other people’s lives but to be a friend and positive influence. It is through the recovering alcoholic Richard from Texas (played by Richard Jenkins) that Liz learns to forgive herself and is then ready to move on. The final leg of Liz’s journey takes place in Bali, Indonesia. It is here that Liz learns to love. 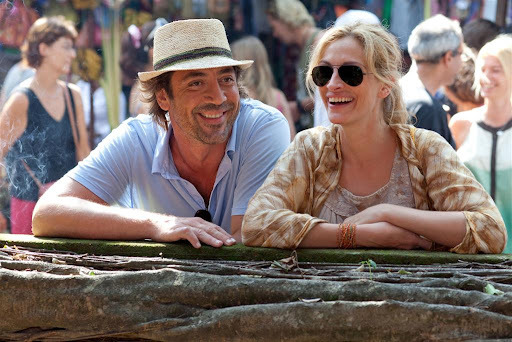 She learns not only to love herself again but finds love in Felipe (Javier Bardem). Eat Pray Love is the type of film that should greatly inspire people to travel and to find themselves and in fact, both the film and the book on which it is based has inspired a mass of copy-cat tourism. As a traveller who frequently falls in love with cities to the extent that my heart aches for them afterwards, I found the film entirely dissatisfying in its lack of focuses on the cities Liz was visiting. There was the obligatory sweeping cinematography in Rome with some impressive panoramic shots of the city and there were some great aerial shots of Bali but I didn’t find anything in the film that made me long to visit any of the locations (and both Italy and Bali are top in my to-travel list). Apart from a wedding scene, there was no focus on India outside of the asram. Perhaps there was more about the local people, customs and history of the places Liz visited in the book but I didn’t see enough of it in the film. As a film lover, I found the film to be quite dragging and far too long. This is not the type of film that you should get bored in, especially if you are a lover of travel and food but I did not enjoy it. Thankfully the actors in the film were all impossibly beautiful and I was able to keep myself occupied thinking about that. I would say that he crux of the matter is that Liz Gilbert was so hard to relate to, no matter how charmingly Julia Roberts tried to portray her. She walked out on her husband for no reason other than that he didn’t want to join her on yet another international trip, she was undeniably privileged and in reality, the whole trip was financed by an advance from her publishers. In all of that, she flits through cities and friendships and at no time in the film is that shown with any depth. There is no doubt that Eat Pray Love has been a popular book and I imagine that many people will flock to see the film too. I ‘got’ the film but I just didn’t like it very much. I give it one-and-a-half stars out of five for some decent cinematography, good looking actors and some reasonable acting. Yes, I’m being generous. 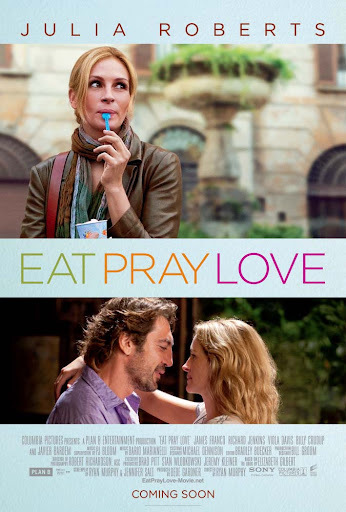 Eat Pray Love will be released in the UK on 24 September 2010. I have not yet finished this book. So I haven't read your full review but I see that you only gave 1 and a half star? ouch ! My first impression of this film was just another weeping romance flicks where we get to see three places in the world. And another typical Hollydud flick. Instead, I found it to be more philosophical than a simple teary eyed love story. The film teases us with 3 separate world sites, not quite enough to spark an interest in world travel. There I found the film a bit lacking; however, I thought the cinematography to be exceptional. (nothing caught fire, exploded, nor were there car chases and crashes - refreshing). Skeptical of a sappy love story, I was captivated by the philosophy of one loosing themselves and their journey to find and redefine their personal selves. I enjoyed this film through it's deeper meaning and making me the viewer think about myself and those I meet. oh dear! I was wondering whether to watch this or not cause the trailer didnt look very tempting anyway. I am so glad you posted this review. I read the book because I thought it would inspire me in some way. It was the worst book I've ever read. I read many books. It lacked any feeling whatsoever and much of the story was not believable. I'm glad you pointed out that the publisher's gave her $$$$ in order to write the book. I was debating on seeing the film because I like Julia Roberts and thought maybe she could pull off a believable story with some heart. I however think I'll pass on it now. Thanks for the review. @ Kathryn: Yeah, 1.5 stars! It is exactly the type of film I should love but I got bored! @ Dempsey: It is interesting that you say that because I hadn't previous thought that Julia needed a comeback film but maybe you are right! This isn't it. @ Rob: I agree with you about the cinematography and I am glad that the philosophical aspect of the film appealed to you. Perhaps you'd enjoy the book? @ Jo: See now, that was precisely what I had heard already about the book and the reason I hadn't read it. Julia wasn't too bad but the whole premise of the film is.